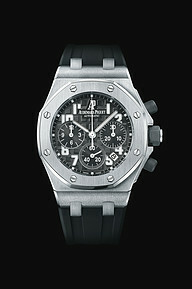 Selfwinding chronograph with date display and small seconds at 6 o’clock. 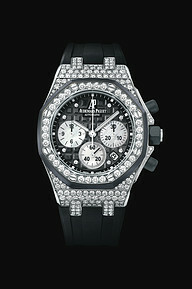 18-carat white gold case, black dial, black strap. 323 brilliant-cut diamonds, ~5.90 carats. Selfwinding chronograph with date display and small seconds at 6 o’clock. Forged carbon case, black dial, black strap. 32 brilliant-cut diamonds, ~1.25 carats. Selfwinding chronograph with date display and small seconds at 6 o’clock. 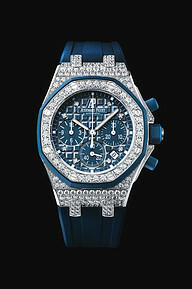 18-carat pink gold case, blue dial, blue strap. 323 brilliant-cut diamonds, ~5.90 carats. Availability to be confirmed. Selfwinding chronograph with date display and small seconds at 6 o’clock. 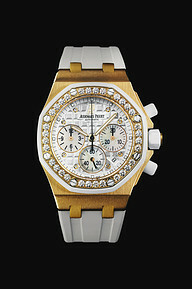 18-carat pink gold case, silvered dial, white strap. 323 brilliant-cut diamonds, ~5.90 carats. Selfwinding chronograph with date display and small seconds at 6 o’clock. 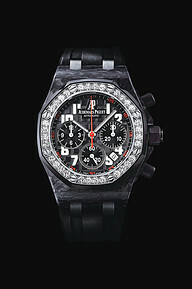 Stainless steel case, black dial, black strap. Selfwinding chronograph with date display and small seconds at 6 o’clock. 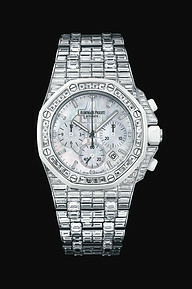 18-carat white gold case, white mother-of-pearl dial, 18-carat white gold bracelet. 456 baguette-cut diamonds, ~41.3 carats. Selfwinding chronograph with date display and small seconds at 6 o’clock. 18-carat pink gold case, brown dial, brown strap. 323 brilliant-cut diamonds, ~5.90 carats. Selfwinding chronograph with date display and small seconds at 6 o’clock. 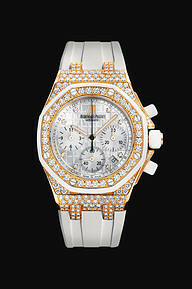 18-carat pink gold case, silvered dial, white strap. 32 brilliant-cut diamonds, ~1.25 carats. Selfwinding chronograph with date display and small seconds at 6 o’clock. 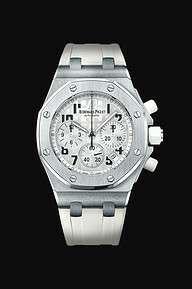 Stainless steel case, silvered dial, white strap. Selfwinding chronograph with date display and small seconds at 6 o’clock. 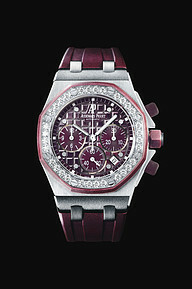 Stainless steel case, plum-coloured dial, plum-coloured strap. 32 brilliant-cut diamonds, ~1.25 carats.